Friendly Valley maintains a security force 365 days a year. The Guardhouse at the Friendly Valley Parkway entrance is manned 24 hours a day. Security personnel patrol our community day and night by car and periodically by foot. Security personnel enforce Friendly Valley Rules and Regulations for traffic, parking, facility usage, pets, safety issues, offensive activities, etc. The Security Office issues Parking Permits and Guest Badges for visitors (with a $10 refundable deposit. Temporary Parking Permits for new and rental vehicles can also be obtained in the Security Office. The Security Office hours are 8:30am to 5:00pm Monday through Friday, and as needed after normal office hours. Disclaimer: Friendly Valley Security Department and the Recreational Association strive to provide deterrence to crime. However, no matter what steps are taken, our community can never be completely safe and secure. Residents are encouraged to take common sense precautions such as carrying insurance against loss, keeping your doors locked, refusing to open your door to strangers, asking workmen for identification, locking your car, and not leaving valuables in plain view. To start accessing dwellingLIVE please call the Security Office (661) 252-2666 during normal business hours (Monday to Friday 8:30 AM to 5:00 PM). The Security Office is the collection point for lost or found items in Friendly Valley. If you have guests staying with you, please be sure to stop by the Security Office to get parking passes for their cars. Your car decal is numbered for Security Reasons. Leave your number on your decal. Be aware of IRS scam calls! The IRS will not call you! 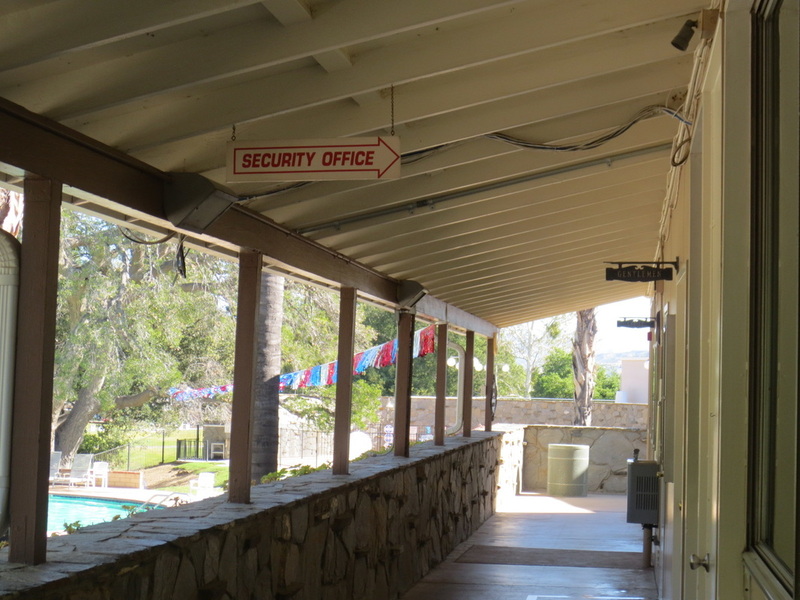 This picture shows the entrance to the Security Office. Note the sign on the ceiling. 1. When a neighbor is missing or you notice newspapers piling up at the front door. 2. If you see people playing golf who appear to be too young or are not with a member. 3. When a car is parked on the street more than 48 hours with no Friendly Valley decal on the windshield. 4. If a salesman or solicitor comes to your door or if advertising fliers are distributed. 5. When you see someone walking in the common area that you don’t think belongs there. immediately and then call Security. 7. To inform Security of the location of a hidden key if your unit must be entered in case of emergency. 8. If a water pipe breaks and you don’t know whom to call.